Home > News > Can Retailers and the Environment be Compatible? The BBC’s ‘Blue Planet’ documentary series brought with it a fresh wave of focus on the impact of human behaviours on the environment. There has been a backlash against single-use plastic in particular, but further than that consumers are demanding changes within retail to improve the industry’s sustainability and ecological impact. From individual protests where customers have been unpackaging their fruit and vegetables within stores and leaving the unnecessary plastic wrap for the retailer to deal with, or sending packaging back to the manufacturers using their freepost address, through to online petitions demanding the banning of palm oil, and of diesel cars, and of single-use plastics, and….the list goes on. There is a mood across the nation that something needs to change. And the pressure is on brands and retailers to respond. But has anything actually changed? Some retailers have responded and made changes. Morrisons for example, the UK’s fourth largest grocery retailer, has made changes recently in response to customer demands for better environmental practices; increasing the amount of loose fruit and vegetables for sale, providing paper rather than plastic bags for these items, and customers can now also use their own containers at the butchers and delicatessen counters. Small steps, but it is a move away from the pre-packed, plastic wrapped produce to which we had become accustomed. And it isn’t just packaging. Dirty palm oil - where rainforests are destroyed for palm oil production - is another area where consumers are realising the environmental damage that using such ingredients can cause, and are putting pressure on brands to remove this from their own products. The reality is that palm oil is in an astonishing amount of our everyday products, from chocolate to shampoo. But with Greenpeace reporting that dirty palm oil causes the deaths of 25 orangutans every day, customers are demanding manufacturers remove palm oil from products or use palm oil certified as sustainable. In response, Iceland’s Christmas advert focused on this very issue, and achieved widespread publicity through the advert’s ban, promoting their move that by the end of 2018, 100% of Iceland’s own brand food will contain no palm oil - the first UK supermarket to make such a commitment. Richard Walker, Iceland Managing Director, explains, "Until Iceland can guarantee palm oil is not causing rainforest destruction, we are simply saying 'no to palm oil'. We don't believe there is such a thing as 'sustainable' palm oil available to retailers, so we are giving consumers a choice about what they buy." In September 2018, as consumer awareness was heightened to the fact that black plastic was not recyclable in the UK, Lidl became the first UK retailer to ban black plastic trays for the fruit and vegetables sold within its stores. With a further commitment to remove black plastic from its fresh meat, fish and poultry range by August 2019, and to make 100% of its own-label packaging widely recyclable, reusable or refillable. Walkers crisps is another example where customer pressure has brought about change. Following a campaign where customers posted their Walkers crisps packets back to the manufacturer, Walkers recently announced they had joined in partnership with TerraCycle to launch the UK's first nationwide recycling scheme for crisp packets. A recent survey reported that 71% of consumers consider the environmental impact of their choice of products within food and grocery, and the examples above show how grocery retailers and brands have responded to customer pressure. But this number falls to 64% for clothing and footwear. Perhaps because the environmental impacts of these sorts of products is more hidden. We don’t see the plastic packaging waste, for example, as this is removed before clothes are displayed in-store. Yet dig a little below these topline statistics and we find the percentage of customers considering the environmental impact of their shoes and clothes increases for younger shoppers - to almost 70% of under 34’s. And the recent wave of documentaries such as ‘The True Cost’ and Stacey Dooley’s ‘Fashion’s dirty secrets’ have served to bring the fashion industry and its environmental impact to the fore, with increasing pressure for more sustainable, ethical practices within the clothes industry too. In response to the demand by younger consumers, ASOS recently launched a new collection for environment-focused shoppers, with a range that is animal-free and uses sustainable cotton. Other brands such as H&M, Adidas and G-Star Raw have also launched recycled collections. Better Retail, Better World is a recent initiative bringing together a number of prominent retailers committed to reducing environmental impacts and improving social conditions. GAP, M&S, Clarks, and Next are among the retailers taking part in the initiative that uses the United Nations Sustainable Development Goals as a framework. “Put simply, this action will mean further safeguards against people falling into the modern slavery trap by paying to get a job, reductions in greenhouse gas emissions, deforestation and waste sent to landfill and more support for people from underrepresented demographics to progress in employment”. The aim is that by working collaboratively the impact will be greater than by retailers working alone. However given the fashion industry is reported to be the second most polluting industry after oil, there is perhaps a long way to go before the industry can be viewed as truly environmentally responsible. Filippo Battaini, research associate at FGRT, suggests the slow response of the fashion industry to environmental pressures is attributable to consumers desire for low costs, “Consumers may say they want sustainability, but there is little evidence of mass-market shoppers willing to pay substantially more for sustainable goods”. The UK Government, perhaps frustrated at the slow pace of progress within the fashion industry has established an Environmental Audit Committee, led by Mary Creagh MP. She has recently written to the ten leading UK fashion retailers asking what steps they are taking to reduce the environmental and social impact on the products they sell. Creagh explains, "The way we design, produce and discard our clothes has a huge impact on our planet. Fashion and footwear retailers have a responsibility to minimise their environmental footprint and make sure the workers in their supply chains are paid a living wage. We want to hear what they are doing to make their industry more sustainable." The responses from retailers were received in October 2018 with further hearings having taken place during November 2018. There is a growing awareness and demand from customers for retailers and brands to make changes and reduce their environmental impact. Notable examples, including those we have looked at, have reviewed their practices and made changes. But more needs to be done, particularly in fashion, but across the retail industry as a whole to ensure that changes are made to reduce environmentally damaging practices and also re-educate the wider population in terms of sustainable buying behaviour. These changes won’t be made overnight but there is certainly a hunger for this change in a way that we have never seen before. 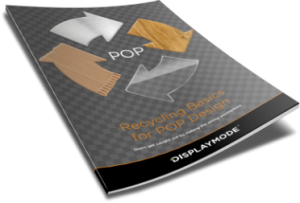 Learn how you can reduce your own environmental impact with eco-friendly POP displays. DESIGN RECYCLING INTO YOUR POP!